"Book Review - From Disaster to Destiny: A Review of Methods for Disaster Mental Health Research" by Andrea C Walker, Ph.D. 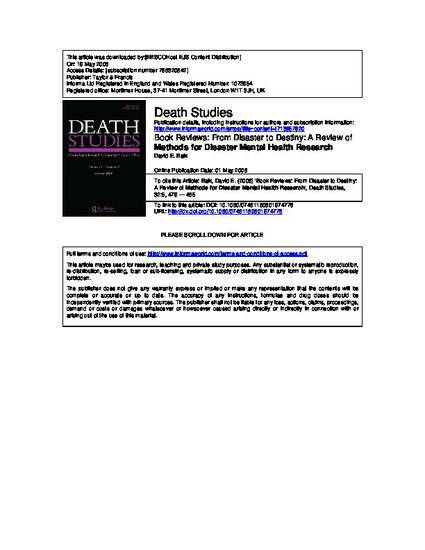 Selected Works of Andrea C. Walker, Ph.D.
A review of Methods for Disaster Mental Health Research edited by Fran H. Norris, Sandro Galea, Matthew J. Friedman, & Patricia J. Watson. New York: Guilford Publications, 2006. 326 pp. (ISBN: 1-59385-310-6). $43.00. Reviewed by Andrea C. Walker. Contact Andrea C. Walker, Ph.D.